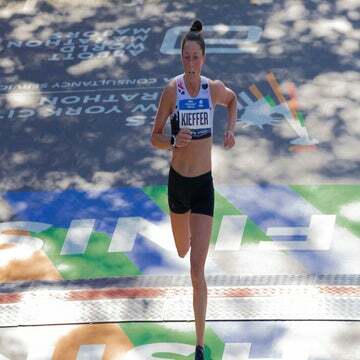 In her new column, pro marathoner Allie Kieffer gets real about goal setting. With the first couple weeks of 2019 behind us, I’ve been thinking about my New Year’s resolutions. As a teenager, I had trouble coming up with resolutions. My mom would ask which goals I’d chosen and I’d stare back at her, unable to grasp that I could improve and become more than I already was. Back then, it seemed as though my future was predetermined by the abilities I was born with or without—that because I wasn’t inherently good at school, I wasn’t smart. I thought some people were blessed with superior genetics and others simply weren’t. In my teenage mind I was in the second category, and other than in running, I wouldn’t and couldn’t be successful. I grew up embarrassed about my academic inability. Time compacted my insecurities, failure led to more failure and eventually I stopped trying. Instead I threw myself into running, feeding off my athletic successes. As a 16-year-old I accepted a scholarship to join Wake Forest University’s cross-country and track teams. Even though the school is better known for its academics, I was only attending for the athletics. Going away to school and growing up seemed to be about becoming something, learning the skills for a particular job that eventually singularly defined you. The summer before I left for school, I remember questioning why I was even going. I knew I wanted to run though—and if I only had one gift, I figured I should maximize it. In August of 2005, I arrived on campus with a fire inside of me and a goal to become the Atlantic Coast Conference’s Freshman of the Year. I was wide-eyed and excited by the opportunity to join one of the best teams in the nation and run in the footsteps of All-Americans. I had even bigger goals for myself on the track over the following years, but after only one semester I found myself on academic probation and running slower than I had in high school. The running problems were an issue I understood—due to higher-caliber competition, changes in training, going out too much, not recovering and making poor dietary choices—and seemed solvable, but if I didn’t do better academically, I’d lose my scholarship and get kicked off the team and out of school. Thankfully one of my teammates, Liz, offered to tutor me. I had placed into what I referred to as the ‘not ready for college’ English class, comprising a tiny group of mostly athletes who were probably thinking the same thing I was: that we weren’t meant for the classroom. Liz and I met in almost every hall on campus. She read a few paragraphs at a time, kindly critiquing or asking questions, and then on my own I’d look things up, add more detail and learn how to use semicolons. After lots of tutelage, I got my first A in that English class. For so long I had limited myself in an effort to protect myself, but that class proved that I could excel beyond the track, if I tried. One year ago an essay I wrote on body image was published in Self. Today, this post launches my first online column with Women’s Running! For a girl who started in the ‘not ready for college’ English class, I’ve come pretty far. As my life evolves, so does my belief in myself. I have realized that we’re eternally growing and changing—there is no final destination to becoming. Growing up is not defined merely by a job but by the person you are, the things you see and do, the way you treat others and the way you treat yourself. Failure doesn’t mean you’ve been born without some essential abilities; it is a step toward becoming something even grander and can be an empowering result of attempting something that most wouldn’t try. Over the years, through resolutions, I’ve often tried to better myself by pledging to work on my weaknesses. I honestly haven’t made much progress, though. I rarely look back at them because, when I do, I feel like I’ve been running away from insecurities rather than toward my goals. I’ve put a microscope to my shortcomings before and it limited what I thought I was capable of. This year though, I am more interested in all of the possibilities of what I can become. I am emboldened by the power of bettering myself by reaching for my wildest dreams. Step 1: Identify your wildest dreams. Olympian: finish top three at the Olympic Trials. Run sub-31:30 in the 10K, sub-2:26:00 in the marathon and sub-1:09:30 in the half marathon. Step 4: Create daily, weekly or monthly objectives for each goal. Do whatever is written on my training log, no excuses. Eat at least three servings of vegetables and two servings of fruit each day. Strength train five times each week.